A sign identification decal is required on the back of all signs installed by the Texas Department of Transportation (TxDOT) after August 15, 1980. TxDOT's Standard Specifications for Construction and Maintenance of Highways, Streets and Bridges provides the specification for the sign identification decal. The sign identification decal is used to record sufficient information about the reflective sheeting to determine its origin in case of premature failure of the material. The Traffic Materials Branch of the Construction Division (CST) should be notified of suspected failures. Information reported to the Traffic Materials Branch (CST) should include the location and orientation of the sign. the date on which the sign was installed in the field. Identifying the date of installation facilitates analysis of the durability of different manufacturers' sign materials under varying field conditions and assists in determining the need for replacement. The sign fabricator performs the initial (fabrication) coding of the sign identification decal (description follows) and affixes it to the sign back in the lower left hand corner in such a way that the sign support does not block the view of the decal. Figure 3-1 shows an example of a sign identification decal. The rows are numbered for reference to the following fabrication and installation coding instructions. Row 1: Indicate the fabricator of the sign as follows. Row 2: Punch out the letter indicating the month of fabrication. Row 3: Punch out the three-digit group indicating the decade of fabrication (for example, punch out "201" for fabrication from 2010 through 2019). Row 4: Punch out the digit indicating the year of fabrication (for example, “8” for fabrication in 2018). Row 5: Punch out the letter indicating the code for the manufacturer of the sheeting applied to the substrate. Manufacturer codes are located in the Material Producer List-Sign Face Materials. 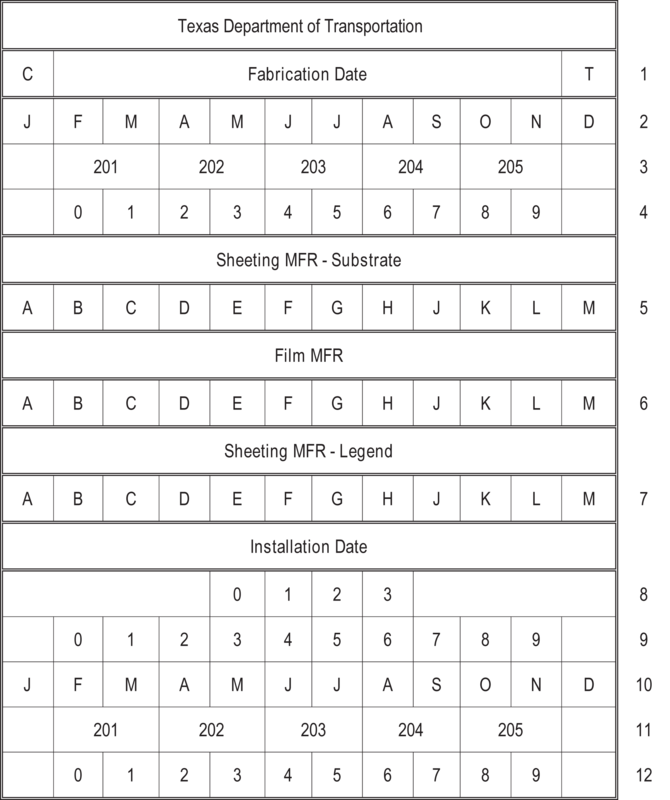 Row 6: Punch out the letter indicating the code for the film (colored transparent or non-reflective black) manufacturer. Manufacturer codes are located in the Material Producer List-Sign Face Materials. Row 7: Punch out the letter indicating the code for the manufacturer of the sheeting for the legend. Manufacturer codes are located in the Material Producer List-Sign Face Materials. Row 8: Punch out the first digit of the installation date. Punch out the zero for dates 1 through 9. Row 9: Punch out the second digit of the installation date. Row 10: Punch out the letter indicating the month of installation. Row 11: Punch out the three-digit group indicating the decade of installation (for example, punch out "201" for installation from 2010 through 2019). Row 12: Punch out the digit indicating the year of installation (for example, "8" for installation in 2018). After the decal has been coded, the decal should be affixed to the sign back in the lower left hand corner so that the sign support does not block the view of the decal.